Kieran Sheehan in action as 'The King'. On the afternoon of August 16, 1977 Elvis Presley, ‘the greatest rock and roll performer in the world’ passed away. The King of Rock and Roll was dead and there was no other king to take his place, but one local man has kept the spirit and memory of Elvis alive to this day. Kieran Sheehan from Kilbehenny, was just three years old when Elvis died but now almost four decades later, the ‘King’s’ anniversary is a big date on Kieran’s calendar. Kieran is one of Elvis Presley’s biggest fans and after falling under his spell as a young ten year old, over the years collected an enormous amount of memorabilia relating to his idol. 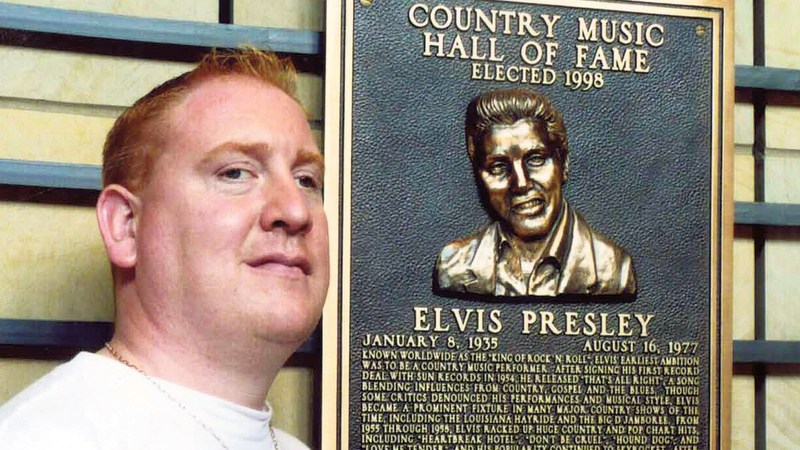 Kieran Sheehan pictured on a visit to The Country Music Hall of Fame and Museum in Nashville, Tennessee. “I saw him on television and I loved his music so much that I went out and got a guitar like him,” Kieran told The Avondhu and as he got older, he followed Elvis’ career more closely and started buying videos, tapes and books to find out more about the star’s life. Kieran, a very accomplished singer has published videos on YouTube of him singing Elvis songs and it was his wonderful Elvis impression and soothing voice which earned him a gift of one of his most prized possessions. On a visit to Graceland he met Sandra Tutt, the wife of Elvis’ drummer Ronnie and after he sang a song to her, she presented him with copies of original newspapers from the day after ‘the King’s’ death. Kieran Sheehan in action as ‘The King’. He also had the honour of recording ‘The Wonder of You’ in Sun Studios and stood exactly where Elvis would have stood when he was in there recording. Kieran has visited Graceland on a few occasions and while many fans flock to the location on the ‘King’s’ anniversary, Kieran said he prefers to go there when it’s quieter, so that he can savour the experience and feel a connection to the place. And while he emulates the wonderful Elvis on stage, he also shares the same tastes as ‘The King’ when it comes to his mode of transport – two cadillacs that he owns and drives with pride. “Having the cadillacs is part and parcel of being an Elvis fan and I have a 1979 Cadillac Sedan Deville, a 1976 Cadillac and a stretch limousine that I use for weddings, debs and other events. For me, having a cadillac is as close as I can get to Elvis,” Kieran explained. One of Kieran’s dreams would be to become an ETA – an Elvis Tribute Artiste, but he said that there are so many out there, it is very competitive and costly to get all of the outfits. So far, as well as the YouTube videos, Kieran has sang at a few weddings and it’s something he would like to continue with, as it is his way of paying tribute to Elvis – the artiste and the man.